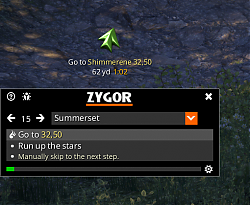 Important: You can't run Zygor's guide and this guide together. 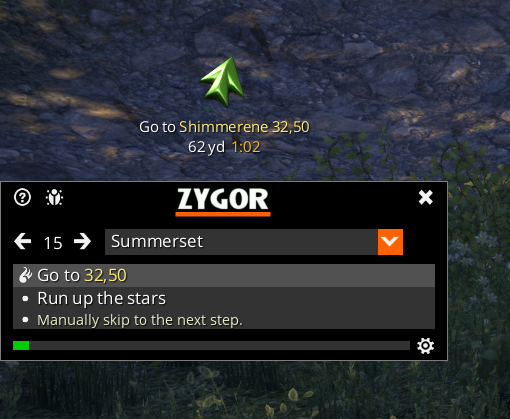 It is imperative that you disable Zygor's official guide from the Addon menu. If you run both, ESO becomes unstable. Don't worry though. This guide has everything Zygor's has and more! - If you use Bandit UI, disable its minimap and go with Minimap by Fyrakin. 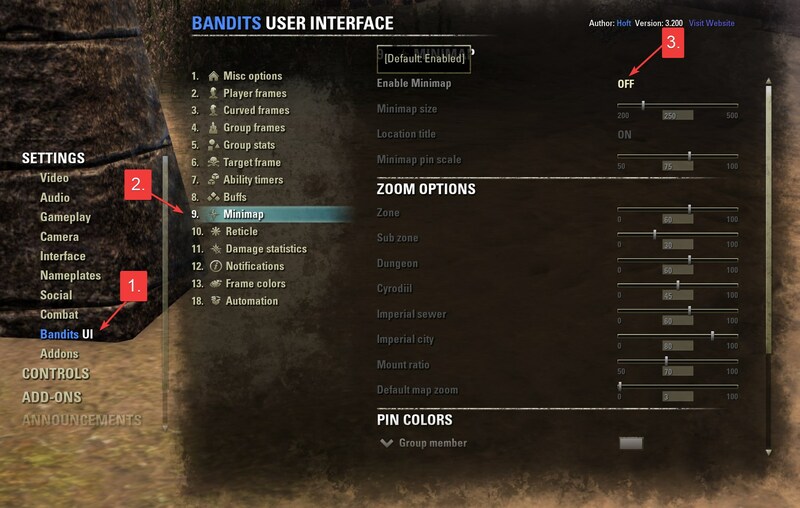 Here's how to disable Bandit's Minimap. Please note, I can provide some support for existing bugs. 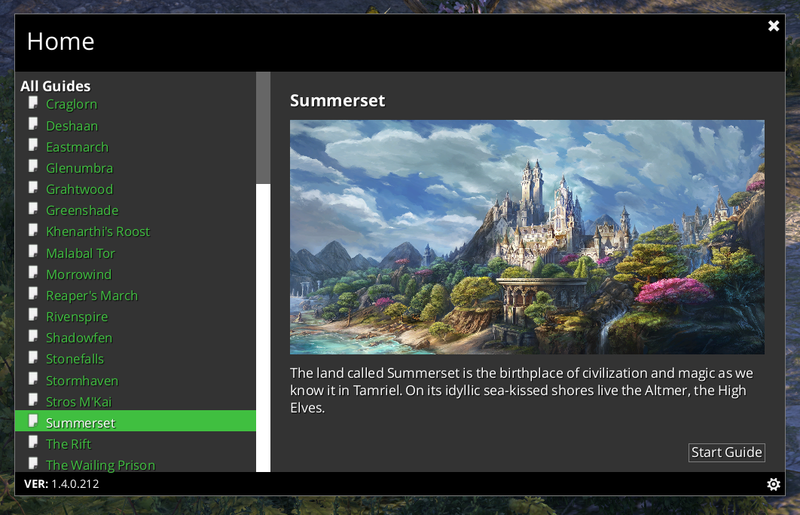 However, please remember that I did not author the tool nor those other guides, so my experience is limited to the Summerset guide. But I will try to patch up where possible. - Reverted changes to the arrow code. The arrow wasn't functional in Summerset and elsewhere. - Enabled ZO_WorldMap_UpdateMap(). This function is required to change the step "X" on the map to match the current step. Latest and best Quest helper? 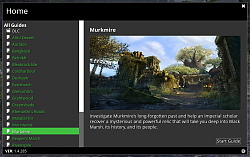 Is this mod the latest and best Quest Helper for ESO? Feeling kinda stupid here. I am trying to set the keybindings to advance steps but I can't for the life of me find the bindings. Is there a bug? Do i have to have ZygorGuidesViewer installed too to get that option but disabled? I'm gonna hang my head in shame now. It's called LEVELING Guide now... not Zygor! Last edited by fostot : 03/24/19 at 05:30 PM. Micro shutters are back :/ , everything else is great. Hey im trying to find the main vanilla story in the Guide and can not seem to find it. 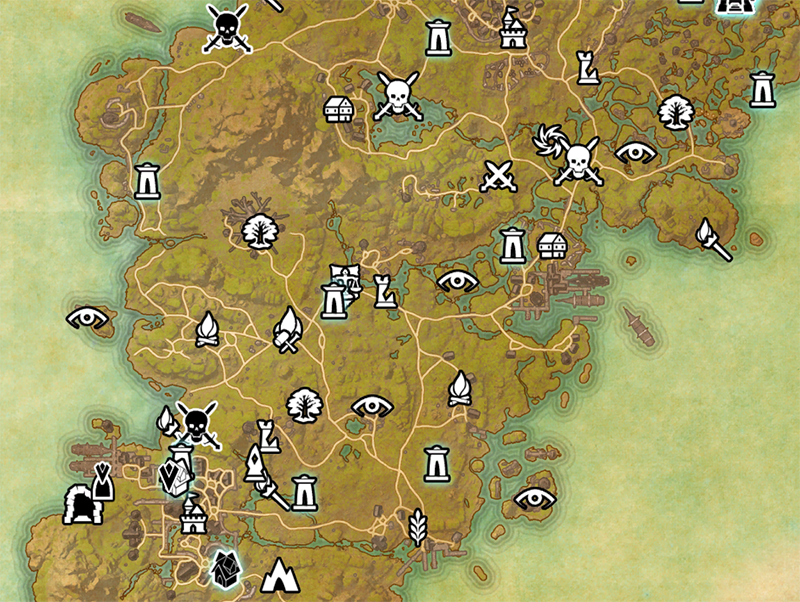 At somepoint During the Auridon Guide all of the Markers (Where the arrow tells you to go) gets offset by 25 ish Yards to the South by Southeast. Not sure if this is just me or not. Just Wanted to let you Know. I can't figure out how to key bind the advance for the viewer, I read here that you stated to press Esc-control and scroll to guide viewer. I'm lost....esc and control at same time? if that does nothing, also there is nothing I can find in the list of key bindings for this addon. Please help. Last edited by Osiris093 : 02/12/19 at 07:10 PM. First off wanted to say great work. just finished the Murkmire guide and it seems like it might be incomplete missing a bunch of quests that i'm doing now manually, not a huge deal just wanted to make a comment! When I completed the guide, I ran through it with a fresh character from beginning to end to ensure I wasn't missing anything (at least, at the time the guide was assembled). I'm only one person so it won't be perfect. Please let me know which quests are missing. Last edited by Harath : 01/27/19 at 11:00 PM. Re: I Have to Manually all step? I Have to Manually all step? the green bar never move ? or i did something wrong ? I Have to Manually all step? Thanks alot for the fast reply and even fixing the issue with this addon. You're welcome both. Glad I was able to fix the issue. Easier than I thought it would be. Zygor loaded their "foglight" for ****s and giggles but wasn't actually using it. Sigh... lol. Anyhow, I've removed it in the 421 update. You should now see all discovered POI icons. 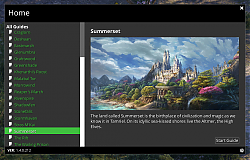 I'll work on a guide for Elsweyr; ESO's next expansion. The announcement happens on the 15th. I suspect we'll see it sometime in Q3 (July-August-September). Last edited by Hydra9268 : 01/07/19 at 03:44 PM. Last edited by Hydra9268 : 01/05/19 at 11:21 PM.